When my friends heard that I would be making Challah for the Bread Baker’s Apprentice Challenge, everyone told me the same thing: challah makes the BEST french toast. And since french toast is one of my favorite things to eat for breakfast, of course I had to give it a try. As promised, I took half of the homemade challah to my sister and brother-in-law yesterday (which resulted in me staying at their house for a rousing game of Monopoly). But I saved part of the loaf for myself, allowing it to stale slightly overnight so that it would be in perfect condition to play the leading role in my favorite breakfast. I have already shared my standard French Toast recipe with you, including step-by-step photos, so I’m not going to go through the whole thing again. But I did make a few changes this time that might interest you. Namely, I fried the french toast in oil. Lately I’ve been reading Molly Wizenberg’s book, A Homemade Life: Stories and Recipes from My Kitchen Table. Just like her blog, Orangette, Molly’s book is beautiful and filled with recipes that I can’t wait to try. One of the recipes is for her father’s French Toast, which is similar to mine in all ways except for the frying method. I’ve always been a butter girl, but was intrigued by Molly’s father’s reasoning that frying the french toast in hot oil seals and crisps the outside of the bread while the inside turns into a soft custard. Of course I had to give it a try. I coated the bottom of my cast iron skilled with canola oil and mixed up the eggs and milk while the oil heated. I combined 2 eggs, 1/2 cup milk, a splash of vanilla, a pinch of sugar and a pinch of salt and whisked it together well. I dipped the thick-sliced challah into the egg mixture, allowing it to soak up a bit of liquid on each side, but not soaking the bread completely (I prefer my French toast on the slightly dry side). Then I transferred the dripping slices to the hot oil. I cooked them for a minute or two on each side, until they were golden brown and crisp all over, then transferred them to a paper towel-lined plate to soak up any extra oil. These french toast slices were beautiful! The oil crisps up the bread much better than butter and I loved the texture of the interior, which was soft and creamy where the bread had been soaked in egg batter and a bit chewy in the very center where the bread stayed mostly dry. If you prefer a creamier french toast, you can soak the bread completely, it’s all a matter of taste. I still think I prefer the overall flavor of french toast that’s been cooked on a buttered skillet, but the texture of this one was certainly better! And once I added a bit of butter and maple syrup on the top, I was completely happy with this french toast. And the challah? It really might be the perfect french toast bread! You can read about Molly’s father’s french toast on her blog, Orangette, or in her wonderful book, A Homemade Life: Stories and Recipes from My Kitchen Table. You can also find Molly at Bon Appetit, where she writes a monthly column, and on twitter. Even better... is challah french toast made with egg nog! We were thinking the same thing ... I did the same with our challah, which was a GREAT recipe!!! Cannot wait to make the next one! We love french toast and make lots..... I use a dash of fresh nutmeg along with some vanilla or a splash of Fiori di Sicilia..... Can't wait to try the "frying" method..have always used butter. Very pretty French toast, too! I used half of my challah to make French toast the next day as well ... I used a recipe from Epicurious that called for crushed corn flakes. It was ... interesting. I'll definitely try yours next time. Have you considered a combo of butter and oil? Get the flavor AND the crispiness! 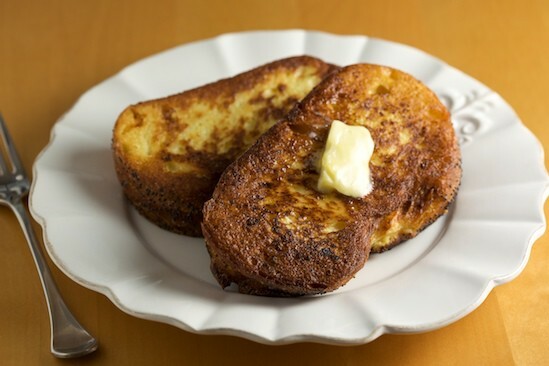 Have you tried using clarified butter/ghee to cook your french toast? I find that the FrToast gets crispy on the outside and stays creamy on the inside and the butter doesn't burn. I add a little cinnamon and orange zest and a dash of orange liquor. Challah French toast was a Saturday morning breakfast feature in our house when I was growing up. We had challah with dinner every Friday night, and on Saturday my dad would treat us to luscious French toast from the leftover bread. It was the only thing he cooked during the week, and perhaps that made it even more special. All of these challah recipes have convinced me that I've got to try it. Great idea to make french toast out of it though! Bet that turned out great! I read Molly's book and was sad when I reached the end, I wanted more! :) I love French toast and don't make it often, but if I have challah on hand that is the bread I use! Something about that eggy bread just makes it so perfect for French toast. I like my french toast lightly soaked too. I've never had challah french toast, I bet it's incredible. Absolutely my favorite french toast method also, you brave girl for making the bread and breakfast! Challah does indeed make the best French toast. I also love pannetone bread at Christmas time. Nicole, this looks fantastic! I can't think of a BETTER way to eat Challah! I can only imagine how great this french toast is! With challah being so light and buttery, it must be the ideal ingredient for perfect french toast. This looks so good. I love French Toast so I will have to try it. Have you ever tried creme brulee French Toast? Whole foods makes it and I googled the recipe in search of a good copy but I just can't make it quite right. I bet you could perfect it and make a lot of people very happy. Luscious! Fortunately, I just made some challah along with getting my BBA ciabatta done. Now I can't wait to try challah french toast! Here's the details on the ciabatta and challah weekend. Delightful! I'm sipping my morning coffee and wishing I'm having this for breakfast. I love breakfast, and this Challah french toast just looks so delicious. Can't wait to make one myself. Love this!